ATtiny85 Bargraph Voltmeter displays an analogue voltage as a bar. For the display I used a low-cost red 10-LED bargraph display, available from Sparkfun , or HobbyTronics in the UK . Alternatively you could use discrete LEDs. The circuit takes advantage of the fact that these bargraph displays give you separate access to the anodes and cathodes of each LED in the package, so we can use charlieplexing to drive the ten LEDs from just four I/O lines. If the package joined all the anodes or cathodes to a common terminal we would need 10 I/O lines to drive them, more than is available on the ATtiny85. The multiplexing works by taking one I/O line low at a time, to select one row of LEDs by taking their cathodes low. The appropriate LEDs in that row are then illuminated by taking their anodes high. Any unused I/O lines are left as inputs, so they are high-impedance. For example, to light up bars 3 and 4 on the bargraph take PB1 low, and PB3 and PB4 high. The grey squares show positions where you can't connect an LED, because an I/O line can't be both high and low at the same time. The two blank cells could be used to connect two more LEDs, to create a 12-bar bargraph. The program would have been slightly simpler if I'd used PB0, PB1, PB2, and PB3 to drive the display, and ADC2 (PB4) for the ADC input, but I decided to use ADC1 (PB2) for reasons that will become clear in a subsequent article. Each set of LEDs is on for a fifth of this time, or 125Hz, which is safely above the frequency at which flicker would be noticable. This reads the data in Display and lights the LEDs for the current row, as specified by the value of Row. The ADC in the ATtiny85 is driven by a clock which is divided down from the system clock; the datasheet recommends an ADC clock of between 50kHz and 200kHz, so I chose a prescaler of 16 which gives a frequency of 62.5kHz. A conversion takes 13 cycles, so we can do about 4800 conversions per second. To avoid noise on the ADC the datasheet recommends that "if any port pin is used as a digital output, it mustn’t switch while a conversion is in progress". The solution I chose was to integrate the conversion into the display loop; when Row is 2 the display loop blanks the display and performs an ADC conversion rather than lighting the LEDs. Each LED corresponds to a voltage of 0.25V, so 7 bars corresponds to 1.75V. You can increase the sensitivity to up to 2.5mV per LED by adjusting the scale factor. Circuit of the ATtiny85 Bargraph Voltmeter. The circuit is powered from between 3V and 5V. I compiled the program using the Arduino-Tiny core extension to the Arduino IDE . Select the ATtiny85 @ 1 MHz (internal oscillator; BOD disabled) option on the Boards menu. This is the default fuse setting on new ATtiny85s; otherwise choose Burn Bootloader to set the fuses appropriately. Then upload the program to the ATtiny85 using the Tiny AVR Programmer Board; see ATtiny-Based Beginner's Kit. Here's the whole ATtiny85 Bargraph Voltmeter program: Bargraph Voltmeter Program. ^ 10 Segment LED Bar Graph - Red on SparkFun. 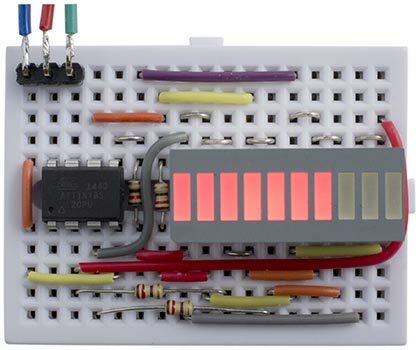 ^ 10 Bar Red DIL LED Display on HobbyTronics.